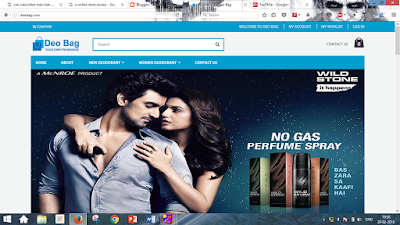 Buying deodorants, perfumes & personal care products online was never so easy. DeoBag.com offers the widest range of deodorants and perfumes online at the most affordable prices. DeoBag.com is the first online dedicated fragrance shop in India offering each and every detail about fragrance before you purchase your favorite deodorants online. DeoBag.com offers more than 2000 mass and premium daily wear deodorants & perfumes online in India covering all international brands like Brut, Reebok, Beverly Hills Polo Club, United Colors of Benetton, Ferrari, Fogg, Jacques Bogart, Nike, Adidas, Wild Stone, Kamasutra and a lot more with upto 70% discounts on MRP. DeoBag.com is initiative by students of GBU (Gautam Buddha University), the Deobag core team consists of five student, and there vision to be the first online store which focus on deodorants only. There founders says it's stocked with hundreds of products ideal for students, everything from basic to core components. Deobag is created to provide the market with access to the largest inventory of genuine, branded Deodorants, Perfumes, Skincare, Hair Care and more at the lowest possible prices. Shop, explore and much more!! It’s The Deobag.com. "We work hard to ensure that your shopping experience is completely satisfying and enjoyable. Along with great selection and prices, our number one concern is offering superior customer service and our staffs are here to serve you."